Rolling Meadows junior Joryn Meehan (2nd R) and Rolling Meadows sophomore Andrew Erickson (R) drive their robot during the competition. The winning alliance in the VEX Robotics Regional event on December 7 at Rolling Meadows High School is comprised of two teams from Oconomowoc, Wisconsin, and Niles North High School in Skokie. 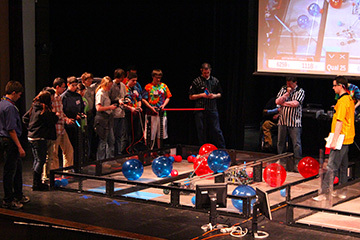 Two WildStang Robotics Teams advanced to the semifinals before being eliminated. Sponsored by the WildStang Robotics Team, which consists of students from Prospect, Rolling Meadows, and Wheeling high schools, the competition involved robots competing in a 2-on-2 tournament with partners changing after each preliminary round. The winning alliance will now compete at the state event in February in Batavia. This is the fifth year of the VEX Robotics competition. For information about the WildStang Robotics Team, contact Mark Koch, WildStang Robotics team leader, at 847-718-5639 or mark.koch@d214.org.